During the natural aging process, the skin begins to lose volume and elasticity, resulting in unwanted lines and sagging. This loss of volume, combined with the effects of gravity, contributes to a less youthful appearance. Volume enhancement with dermal fillers can help counteract this process and restore a more youthful-looking overall appearance. The most popular dermal fillers are considered to be hyaluronic acid-based injectable fillers. Hyaluronic acid (HA) is a naturally occurring substance found within your skin for moisture, flexibility and elasticity. Hyaluronic acid-based fillers have the ability to absorb water from surrounding tissues to help plump up facial areas. They also promote collagen production and retention to help decrease visible lines and wrinkles. Hyaluronic acid-based dermal fillers are considered non-allergenic and their effects are reversible. There are many different types of injectable fillers available to ensure the best results possible. Each has unique characteristics that make it ideal for use in certain areas of the face to achieve specific results. Since each individual case is unique, we consider a number of factors when choosing the ideal filler for you, depending upon which part of the face is receiving the filler, what look you wish to achieve and how long you would like the filler to last. 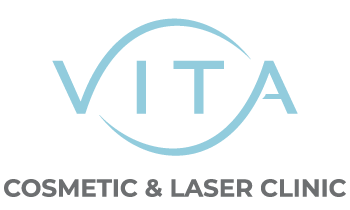 At Vita Cosmetic and Laser Clinic, we use only the highest quality Health Canada-approved products and the safest techniques to achieve natural-looking results. We are a team of highly trained medical specialists with vast experience using dermal fillers to achieve beautiful, natural results. Dermal fillers are used in many areas of the face to fill in and smooth out lines and wrinkles and add volume to restore a more youthful appearance. There are different formulas available to achieve various results. The JUVÉDERM™ family of hyaluronic acid-based products can be used to lift and contour the cheeks to restore lost volume and fullness. Facial lines can inhibit your desire to smile. With JUVÉDERM™, these lines can be smoothed out and plumped up for a youthful appearance. For those who have naturally thin lips or an irregular lip line, or have noticed the thinning of the lips due to age, a lip enhancement using a JUVÉDERM™ fill brings new life to the lips, either filling in or plumping them by adding slight volume, while also smoothing vertical lip lines, depending on the product used. Dermal fillers are administered through an injection using a fine needle. The procedure can be done during a short visit to our office, often during a lunch hour. JUVÉDERM™ fillers contain lidocaine, a numbing agent that helps alleviate pain or discomfort during the injection. Who is a Candidate for Dermal Filler Treatment? Individuals who are experiencing moderate to severe folds and lines, wrinkles or volume loss due to age or who have undesirable facial traits can all benefit from a dermal filler. How Long Do Dermal Fillers Results Last? When patients receive optimal treatment for wrinkles and folds, they can expect results that are instantaneous and last from 6 months to a year. You may experience a small amount of swelling and/or bruising for a few days. Many individuals go back to work immediately after having their soft tissue filler procedure. If you do experience some minor bruising, it can almost always be concealed with makeup. Book your Free Confidential Consultation today and speak with one of our specialists to discuss whether dermal fillers can improve wrinkles, frown lines, or tear throughs.